You are currently browsing the tag archive for the ‘Buffalo Wild Wings’ tag. What a glorious last couple of days I’ve had. This is Week 12 of Basic Foundations, Class 1, at Animation Mentor. The last three months have gone by SO FAST. I can’t even believe it. I’ve had such a great time and I’ve learned SO much! I cannot wait to begin Class 2, the Psychology of Body Mechanics. So fancy! I did well in this first class. I got all my assignments in on time, some better than others. I need to submit a progress reel of everything I’ve done by tomorrow at noon. I will eventually put it up here, but I’d like to get a lot of revisions done on my work before I do. And that’s what my week off is for! My goal for my next class: Become even MORE of a hermit (if it is even humanly possible). I spent about 10-15 hours every week on average on my work during Class 1. My assignments turned out good, and there were definitely a few that some students were impressed by, but I know my stuff could have been a hundred times better if I had just spent more time doing them! So, the goal is to try and hit at least 25 hours of work every week. I really want to squeeze EVERYTHING I can out of this class!! Yesterday, Chuck and I did a tour de Bellport. We drove out to visit his grandfather and my aunt, who coincidentally live about six blocks away from each other. Small world. We got lunch at this place called Spicy’s. Now this place is basically a tiny hole in the wall, with a HUGE cardboard chicken on front beckoning you to come on in and have some fried chicken. It’s right next to the railroad and on the wrong side of them, if you catch my drift. The boyfriend SWEARS by their collard greens, so in we went to buy us some chicken with “spicy” sauce. Now, the sauce wasn’t at all spicy, but it sure was yummy. After 23 years of driving by the place I sure am glad I finally stopped in. Next time we go, I am gettin’ the wings!! We met up with his grandfather, a self-proclaimed “hustler”, and heard some interesting stories about his dancing days in the Navy and meeting Frank Sinatra in a club. Old people sure are great and full of wisdom. Haha. Today is an altogether INCREDIBLE day because it is the eve of the US opening of Toy Story 3!!! It has been 11 years since the last Toy Story, and tonight at midnight I will be going to see the third installment of this beloved trilogy in IMAX 3D. I think I just wet myself. For real. Our plan tonight is to stop by Buffalo Wild Wings and then head over to this movie. This make me think of all those nights at B-Dubs with my CP friends, and about when we saw At World’s End at midnight the day before a bunch of them left the program. I miss them. Anyway, I’m sure I will be back soon with a raving review of the amazingness that is Toy Story 3. For now I’m just gonna hang out with one of the big guys himself until it’s time to get moving! 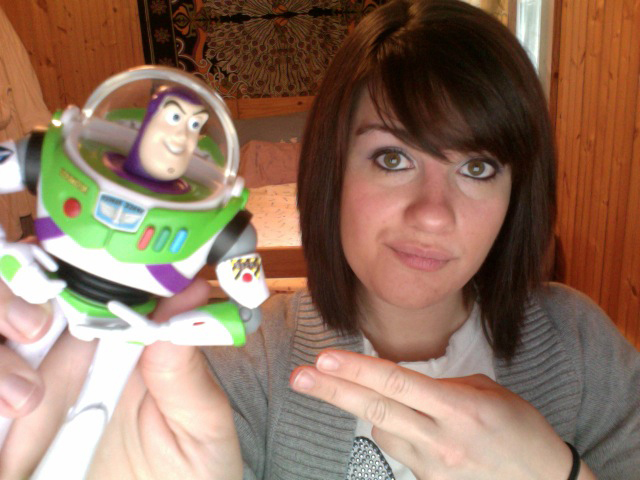 Chillin' with Buzz. It's ok to be jealous.